Winslow on the Shire is a large, English Tudor, luxury vacation rental. You will love this 12 bedroom, 12 bath estate that has all the comfort and amenities to sleep at least 25 and more. Your group will love cooking together around the huge island in the state of the art 1,000 sq ft kitchen with a full Viking Stove and GE Profile appliances, Vita Mix mixer and everything you'd need for the kitchen including coffee maker, ice tea maker, rice cooker, crock pot, spices, etc! Conveniently located off Highway 84 just across the street from beautiful Echo Lake, the Shire is a haven for retreats, weddings, artists' workshops, quilters or for large group events--when family and friends want a unique vacation experience in beautiful Pagosa Springs, Colorado. You and your guests will spend an unforgettable week or more relaxing and enjoying the comfort and amenities of Winslow on the Shire whether you come in the Winter, Spring, Summer or Autumn! We are from California, but visited Pagosa Springs in 2003 and loved the fairytale town with the winding river throughout. When we saw this English Tudor, we took a picture of it, and lo and behold, the next year it was for sale! We drove out to see it and bought it immediately and began five years of renovation. It is our dream home away from home! Every season, Pagosa Springs looks like a painting as you drive throughout the town surrounded by the beautiful Rocky Mountains. 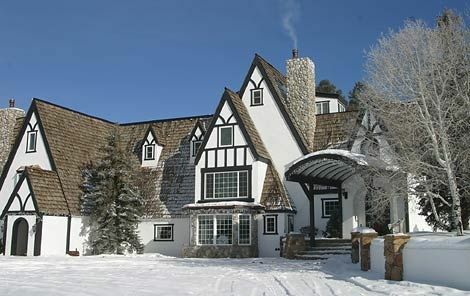 Our favorite style-looks like Snow White's home! It's large and great for reunions, weddings, retreats and parties! The view of the Rockies looks like a painting! 12-Two bathrooms are powder rooms and the rest have shower and/or bathtub. Top of the line-darling laundry room! Plenty of soft, white towels. Three huge living rooms-Great Room, Family Room and Dining Room living area. (2) 2 Dishwashers upstairs and a full second kitchen downstairs. Full sized refrigerator and full sized Freezer. Commercial Kitchen!!!!! Three dining areas plus the entire back porch with three patio tables and chair sets. (3) Full DISH satellite TV broadcast onto 2 plasma flat panels. Stereo throughout the entire house. Hundreds of books on the shelves to enjoy! Pool table, chess set, foosball and lots of board games in the Great Room. Two bursting cabinets full of games! Huge back porch and upper deck with views of the Rocky Mountains. Fenced horse pasture with 3 stall barn. Plenty of room for horse trailers. We had a great time in Pagosa and staying at the Winslow house. This is our second year to stay at the Winslow house. This house is perfect for our group of 30. Very spacious and accommodating. Winslow on the Shire is a magical experience! Our family of 29 stayed over the 4th of July weekend! The home was beautiful and was more than we could ever ask for. A bathroom for almost every bedroom, a kitchen the size of a small home. Living area after living area for people to play games, eat, visit! Each room having a different theme added to the magical visit! If you need a photographer - we were blessed in finding Pagosa Photography, Jeff Laydon, was absolutely the best any of us had ever seen in our lives. We were thrilled with his talent and personality. The town was delightful - providing many activities for our family. Hiking to a waterfall and other nearby beautiful opportunities helped each member of our family have a wonderful time. We will be back to Winslow on the Shire and spread the word to many extended family relatives and friends. Thank you!!! Amazing home! A beautiful place to spend a family vacation! There were 13 adults ranging in age from 24 to 86 and two little ones under two who all thoroughly enjoyed our week in this beautiful place. Everything about it made it an ideal place for our family vacation. The home is clean, spacious, comfortable and beautifully furnished. I loved the art work in every room. The kitchen was a fun gathering place with the large island and equipped with two ovens and everything we needed in meal preparation. The huge round dining room table was one of the many things we loved about this home. The game room was a popular place for the young people and a great place to relax for all of us. There are many activities and fun things to do which our family enjoyed such as: fishing (the lake is close by), horseback riding, mineral hot springs, train ride in Durango to Silverton, shopping, museums, tubing, rafting and beautiful scenic drives. We have a few runners in the family, so they enjoyed the early morning runs. The two restaurants we enjoyed were Boss Hogs and Marconi's in town. This was our 29th annual family vacation and our first in Pagosa Springs. I cannot say enough about how this home exceeded our expectations. The owner, Heidi, was so encouraging from my very first call to her when we were exploring possibilities for our family vacation this year. Her helpfulness and sweet spirit made this an unforgettable experience. The caretaker, Jim, was also very helpful and attentive to any questions we had. Wonderful accommodation for a large group. We have difficulty finding a house large enough to accommodate our large family for our annual reunion. The Winslow was large enough, beautifully firnished and decorated and equipped with everything we could possible have needed. It was the perfect place for this year's reunion. I can't imagine anything a group could need that wasn't available. I highly recommend the Winslow for anyone needing a large, well equipped, beautifully firnished house. Our five night stay at Winslow was unforgettable. Re-uniting with my two older brothers and our extended families was made even better by having such an amazing home to congregate in. It is so comfortable and family friendly. The huge kitchen made family meals a pure joy and the spacious living areas lent to plenty of hanging out together and enjoying each other’s company. We look forward to staying at Winslow again. Perfect for large family reunion! perfect spot! Everyone had their own room, plus there were lots of places for together time and just as many places where you could be alone ~ ideal for everyone. The kitchen is huge so preparing meals was a snap. Everyone raved about the house as well as the beautiful setting and variety of options in the area. Thank you so much for sharing your lovely house, we will be back!